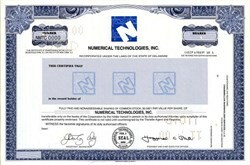 Beautifully engraved Specimen certificate from Numerical Technologies,Inc printed in 2000. This historic document was printed by Thomas Greg & Sons and has an ornate border around it with a vignette of the company logo. This item has the printed signatures of the Company's President and Secretary. 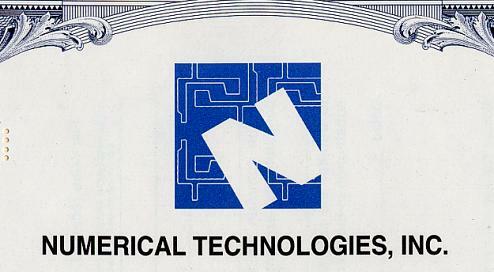 Numerical Technologies, Inc. was a San Jose, California, USA based EDA public (NASDAQ: NMTC) company, previously knowns as Transcription Enterprizes. On March 3, 2003 it was acquired by Synopsys. The company is primarily known for its CATS software for mask data preparation (MDP) in integrated circuit design and manufacturing.